Today we sadly reach the third anniversary of the passing of Kelland Hutchence who was one of the dearest men I have ever had the privilege to call a close friend. Providentially, now the world has a rare glimpse into the personhood of Kelland through last month’s release of “The Loved One”. Perhaps the DVD documentary on Michael’s life could have better been entitled “The Loved Ones” as it presents both father and son through the various interviews and family archive footage. “The Loved One” was very much made possible by the enthusiastic support given to the producers by Michael’s Dad, Kelland. It contains precious video footage of Kell, his deep reflections about Michael as well as some priceless family footage of Michael with Kell, Paula, Tiger, Susie, Rhett, Patricia, Tina and other extended family. There are some sweet scenes with Kell embracing Michael by the pool at Michael’s former villa in Roquefort Les Pines, France. As well as offering more insight into Michael’s life, it is an opportunity to experience the devotion and admiration Kell held for his family. It is refreshingly a documentary void of family factions and criticism (by design on Kell’s part) and as such has been easily embraced by the rest of the family (something Kell would have been grateful for as he always strived to bring the family together, particularly after Michael’s passing). Kell would probably have most appreciated being remembered today as a loving husband to Susie, a devoted Dad to his children and grandchildren and a man who wanted to make a difference in an unfair world. He would have rejoiced in Susie taking up further university studies, Rhett completing a successful book, Tiger growing into a charming little girl, Patricia and Tina embracing his documentary on Michael “The Loved One”, and INXS moving on by choosing a new lead singer and exploring new horizons, as well as taking Michael’s music to a new and mostly younger audience. During his life Kell became increasingly a spiritually sensitive man (as his mother was) and one who saw spiritual solutions as more lasting in this life and the next than financial gain. He loved people and was always generous with his time for those that cared to stop by, write or call him. This was an attribute no doubt impressed on Michael who was similar in disposition. Sadly he was occasionally misunderstood and subject to criticism by those who judged from a distance, but his side of the story is yet to be told. He wasn’t perfect of course and sometimes would draw fire from his candid comments. On the other hand he was never one to hold his tongue when he saw injustice toward others and he deeply felt the peculiar harshness of the press on his son, Michael. He was wonderful company and greatly admired by Michael’s close friends such as Bono, Kylie, and Helena to name a few. I fondly remember his devotion to Susie, his deep belly laughter, his wonderful stories, his caring concern, his ability to comfort Michael’s fans, his hundreds of telephone calls, our walks to Milk Beach, and sips of coffee at Dee Bee’s in Double Bay where he was a regular figure. We miss you Kell. God bless and keep you eternally. As we reach the 8th anniversary of the passing of Michael Kelland Hutchence, the question many are asking is, “Will Michael’s boots ever be filled?” The past year has seen a substantial growth in the number of people visiting his Official Website and leaving him a message in the online Guestbook. Up to 10,000 new visitors a day have been regularly logged, which is an indication that Michael is as popular as ever. Much of the surge in interest undoubtedly must be attributed to the successful RockStar: INXS that rekindled fans adoration for Michael and INXS. As well it has introduced a new and younger audience to Michael’s performances. Apart from RockStar there is a gradual realization around the world of the magnitude of the man and his achievements. It also has been a year marked by the release of two new books featuring Michael, including the candid and humorous biography of Michael’s brother, Rhett Hutchence, “Total XS”, as well as the band’s first official biography, “Story to Story”. Added to this is the much awaited documentary, “The Loved One” by Steve Graham which takes an honest appraisal of Michael’s life, devoid of the usual controversies that one has regrettably come to expect with the “tabloiding” of his private family life. We cooperated with Steve Graham with the production of “The Loved One”, because we all perceived, Kell included, that they would take an honourable and accurate approach to it. Hence there is some delightful footage of our beloved Kelland Hutchence speaking from his heart about his son, Michael, as well as rare footage from the family archives that Kell trusted to Steve. It was Kell’s desire to see an honest and enduring Michael Hutchence video biography. Sadly due to legal delays with the documentary, Kell never lived to see the final production. This year we once again honour Michael and are thankful to God for giving him to this world, his life and his talents that have brought so much joy to so many over the years. We also pray for the protection and healthy nurturing of Michael and Paula’s precious daughter, Tiger Lily. Michael would be honoured by your tributes to him today, whether you light some candles, raise a glass as a toast, or play your favourite Michael songs. So after 8 years, the realization and magnitude of the loss of Michael Hutchence has not diminished and despite the criticism and cynicism of some, it seems no one has filled his shoes, or may we venture to say, no one has even attempted to try. Everyone acknowledges that you cannot replace the irreplaceable. But you can go on with a new entity without dishonouring the legacy Michael left us all. Michael’s shoes will never be filled because there is only one precious and unique Michael Hutchence. Let us remember him with affection, honour him with dignity, and be thankful with a joyous spirit. This is all and everything that we can do on 22nd November, as today is the memorial day for Michael Kelland Hutchence. Michael’s 8th Memorial Anniversary is fast approaching on the 22nd of this month, so as in previous years, we will be gathering in honour of Michael’s memory for a drink and chat at the Sydney Hard Rock Café on Friday 25th November. For those of you who still haven’t been to the Hard Rock Café, you will be awestruck by the magnitude of the collection of impressive memorabilia which adorns every available space, not to mention the larger than life murals of Michael, Jimi Hendrix, John Lennon, Elvis Presley and Kurt Cobain that are hand-painted on the huge dome ceiling. Richard Simpkin, photographer, will be joining us. Richard, who was huge INXS fan while still in high school was inspired by Michael to start photography as a hobby in 1989, the year he first photographed Michael. It was a friendship that would endure the rest of Michael’s life and during those years Richard gathered a formidable collection of photos he would take of Michael whenever he was in town. Ironically the very last person photographed with Michael was Richard Simpkin taken just a day prior to Michael’s untimely death by Michael’s beloved father, Kell. Richard’s private collection of photographs of Michael is perhaps the most prolific anywhere in the world. He also has many warm-hearted stories centred around the times he spent with Michael. 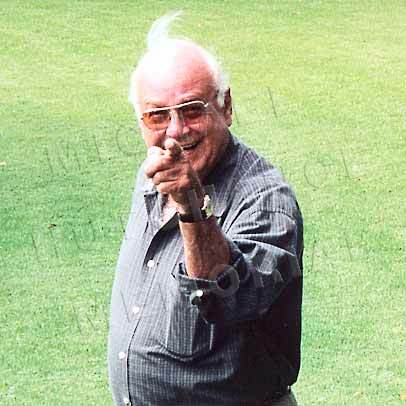 Richard has also photographed many other celebrities but Michael was Richard’s favourite. Michael was always generous with his time and agreed to Richard doing private photo shoots. We wish precious Tiger a very happy birthday. We hope your day is very special, filled with fun and surrounded with love from family and friends. 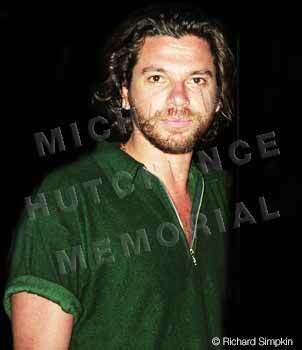 Happy Birthday to our dear Kell Hutchence. You are affectionately remembered and never forgotten. The horror that has taken place in London has reverberated around the world. Ian Patterson, one of our Co-Directors has worked with some of his London music students to try and counteract hatred and violence with the creative and peaceful spirit of music, something Michael would have really identified with. One of Ian’s 15 year old female students, Kalliopi, has written a poignant song that contrasts the images of horror with those of love and peace. With the help of her older sisters, Eve and Madona and Ian’s musical backing, the song was completed on the weekend and placed at SongRamp.com which is the arena for new works in the USA. The song’s creation and its subsequent travelling around the world is lifting the kids spirits in London during a time of great uncertainty. After one day it has made it to number one in the Inspirational Charts and after two days also in the overall category. We ask you to take time and listen as an act of support for love and peace, not just for London, but for the entire world. We know that all fans of Australian music will join with us in expressing our deep sorrow at the passing of another great Aussie musician this Easter weekend, 2005. Paul Hester, 46, father of two young girls and well known drummer with the internationally revered Crowded House will be greatly missed. His funny antics and excellent musicianship skills were an integral part of Crowded House’s image world wide. It’s sad to know that another great group, though now disbanded will always have an empty chair. We convey our heart felt condolences to Paul’s family and friends. We understand your shock, grief and disbelief. We encourage you in these sad times to be thankful and take comfort in all he was and for the music that he left behind for generations to enjoy. To celebrate Michael’s 45th birthday we are delighted to present two new exclusive articles and an unreleased third version of “Deliver Me”. Jodie Patterson, an Australian freelance reporter living in the USA, caught up with INXS’ Kirk Pengilly at the Penfolds Gala Black Tie Dinner in LA last week. Her interview with Kirk, his personal reflections on Michael and pictures can be found here. Ian Patterson completes his article on “How Hutch Composed a Song” with the addition of a Middle Version of Deliver Me that links in with our exclusive interview with Michael’s writing partner, Andrew Farriss. This version has never been released so we are grateful to Andrew and INXS for their permission to include it here as part of Michael’s 45th birthday celebrations. Happy 45th Birthday, Michael. In our hearts and minds you will always stay young. With love from Susie, Mario, Jacqui and Ian. INXS’ Kirk Pengilly attended the Penfolds Gala Black Tie Dinner in LA recently – to honour Nicole Kidman, Mel Gibson and Keith Urban for their excellence in promoting Australia in the United States – part of Australia week celebrations in Los Angeles. Freelance reporter Jodie Patterson spotted Kirk at the after party and called him into the kitchen to request a few words for the fans… Kirk was more than happy to oblige! 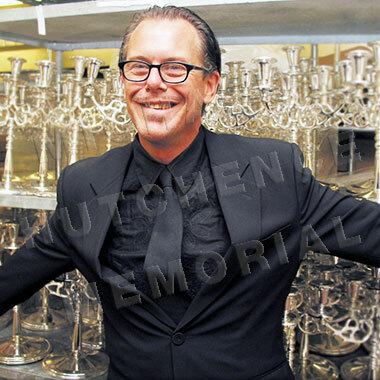 Kirk Pengilly: INXS is heading into unchartered territory now. We are about to do a TV show in partnership with Mark Burnett, CBS have bought the show here in America, and we are doing a world wide search for a new singer. But we are not trying to replace Michael, we just want a new singer, because he’s no longer our singer, and he’s absolutely irreplaceable. One of our criteria, or briefs to the casting agents and all the people involved with doing all the editions is “what we don’t want is another Michael Hutchence”, because you cannot replace Michael. We want someone that is different. Personally, I hope it’s a female, because then there are not the comparisons with Michael. Do you still have thoughts about Michael, do you miss him? Always, absolutely. When Michael died it was a huge shock to all of us, and we all left town – got out because of the press – for about four or five days. I went down to my farm, I got really, really drunk, and I went to sleep. I woke up in the middle of the night after having a dream that Michael visited me. In my dream he came to me as an owl in a field and said: “Don’t worry; I’m finally free, I’m finally happy – don’t worry.” I woke up, balled my eyes out at 3am in the morning, and went back to bed. Ever since then I’ve felt very comfortable about it all, but at the end of the day I miss him very much… but we are a great band, and Michael was very much a part of that. We’re hoping with this show that we are about to do that we will find some amazing fun person, male or female so that we can continue to do what we love doing, and that’s making music. I think Michael would have always wanted us to do that. Do you have some words for the fans that come to visit Michael’s memorial site and fan site daily? Well, I have great respect for that, but you do have to move on. Michael left a great legacy. I have respect for people that still mourn for him and miss him, we will always miss him. He was our best friend, partner, business partner, comrade, part of the six of us. There was always this chemistry between us, and that involved the six of us. Even our original manager became a seventh member, and we always thought there was a chemistry with the seven of us, and whatever we did worked. But I know that Michael would want us to do whatever we want to do now, and would always want us to carry on the legacy of INXS – everything that we made and built as a band, he would condone. I know that he’s looking down and saying that what we are about to do with this TV show is a great idea, and a great thing, and he wants the best for us. As we approach Michael’s birthday, let us focus our thoughts on him and joyously celebrate a powerful, loving and creative soul who touched so many with his voice. We decided, with Kell, that we would continue celebrating Mike’s birthday by having a drink and singing his songs. So, with Kell’s blessing, that’s what we will be doing! The celebration of a wonderfully talented man, Michael Hutchence, who touched our souls and captured our hearts. This year in Sydney, we will be begin celebrating Michael’s birthday on the 16th January 2005. There is a gig happening on this day performed by the cover band “KICK”, who will be performing three 45 minute sets of our favorite INXS songs to sing and dance along to. On Michael’s birthday, Saturday, 22nd January, 2005 all are welcome to call in at Milk Beach, Carerra Rd, Vaucluse, around 5 pm (before sunset) to watch the sun go down, as it is truly an amazing sight from the beach as you see the silhouette of the City. Michael’s ashes were scattered nearby on the same day, back in 1998. Thereafter, we will arrive at The Hard Rock Café in Crown Street, Darlinghurst, Sydney (Phone 02 9331 1116) around 8pm for drinks, and to continue our celebrations in honour of Michael. For more info please call Ange on 0414 554122.